Whew! It�s finished�our little 1983 Winnebago Diesel Minnie Winnie is officially on the road! We left Montana in late July and we are currently in northern Minnesota staying with Matt�s parents. After that, we head to Minneapolis (camping with my fam over Labor Day…woo! ), then to Iowa to be with my family. Then on to Nebraska and Colorado to visit friends. We haven’t converted it to run on veggie oil quite yet…but it’s all ready to go! * Matt and Bella share a closet for their clothes and Lucy and I share the other closet. The closets are the 2 cabinets on either side of the door. * The space under the countertop (where the oven used to be) houses my Vita-Mix, juicer, food processor, and other random items. * The only thing we didn�t update was the bathroom. The shower, sink, and toilet are all in one tiny room�you pull a shower curtain around everything to protect it from getting wet�so we didn�t want to paint those walls. * Bella rides in the passenger seat in her booster. Lucy rides in her car seat in the dinette (there are 2 seatbelts there). * All of my pantry foods and kitchen items fit nicely above the kitchen area. I was pleasantly surprised. The fridge is a dorm sized fridge, which is challenging at times. I�m sure it would be perfect for someone not doing raw foods, but for us it�s a little tight. * Fun fact: Matt sewed all of the curtains. He�s amazing. Yes! It’s true. We have a new home. When we were on our last leg of the tour in the Pacific Northwest, we had decided in our rain-induced stupor, that we were done traveling and we were going to settle down. Luckily, the sun came out the next day and we snapped out of that madness We happened across a Camping World in Burlington, WA that had recently taken a trade-in and it was exactly what we were looking for. We loved it as soon as we walked in. It was spacious, had a large countertop, HUGE windows, a tall full-sized shower, and more. The most important feature we were looking for…a coach chassis. 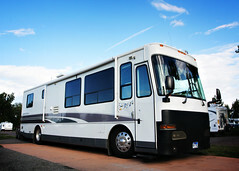 When an RV is on a coach chassis, it sits up higher, drives smoother, is safer, and has tons of storage in the “basement”. After many negotiations, we closed on the RV and drove it directly to Green Eye Auto in Eugene, Oregon to have it converted to run on veggie oil. Finding Green Eye was a huge blessing. We definitely did not want to drive the RV back across the country to have it converted at Golden Fuel Systems…simply because it would have cost us thousands of dollars in diesel!! We have nothing against GFS, just didn’t want to pay for the gas We talked with Clark at Green Eye on our way through to Portland to make sure he was willing and able to do larger systems, and he was. After a week in the shop (and a lovely visit in Eugene! ), we were back out on the road with Matt’s custom “dream” veggie oil system. A big thanks to Clark and crew…they know their stuff and we highly recommend them to anyone looking to “go veg”! After one last stop in Washington, we arrived in back in Bozeman (home of our first RV remodel!). While we were there, we spent a lot of time with our friends at the Refuge Sustainable Building Center talking about flooring and paint options. We finally decided and got everything painted and built a loft for Bella. A few weeks later, we traveled on to Matt’s parent’s home in Minnesota and finished the bamboo floors and other small projects. There are always little projects going on of course, just like a “real” home, but we have finished the big remodel. All in all, we LOVE our new home. It suits us perfectly and we’ve loved every minute in it. I know you have been patiently waiting for photos…so here they are! Click here to be magically transported to the Flickr set of our new RV. Some of the photos have notes on them, so if you click on the main page for the photo, you can see the notes. Where is the big blue RV now? We sold it to Jeff, Kim, and Parks…in Plano, TX. Jeff flew into Seattle to pick it up and drove it back to Texas. Just in case you missed that blog post, you can read more here. They have been busy making it their own and will start traveling as soon as they get everything in order. Why did you need a new RV? We didn’t NEED a new RV…it was not essential to our survival on the road. However, we knew that we wanted to make our life on the road more permanent and the new RV allows us to do that. It’s heavier, easier to drive, has more room to stretch out/entertain, I could go on and on, but it’s just better all around. Are you going to continue doing demos around the country? We are still going to be traveling around the country, but we are not planning a lot of public demos this year. We aren’t opposed to doing them, but we aren’t seeking them out as actively as last year. This year will be specifically for processing all of our thoughts from the past year…along with doing a lot of writing, catching up on blogs, and photography. We’re settling into “real life” on the road…which means more time with just us as a family (instead of being with other people 24/7) and enjoying the beauty of our country without a super strict timeline. Our loose plan right now is to travel to NYC in a few weeks, then down the East coast, hitting the south and the west in the winter after we fly back to the Midwest for the holidays…similar to last year’s route without as many stops. We love life on the road! Do You Smell Sunflower Seeds? Yes! That’s because Matt just created and installed our new counter top and table. They are made from Dakota Burl, which is compressed sunflower seed shells held together by a soy-based resin. It’s an incredibly renewable resource, as it can be re-grown in four months. I’m so thrilled to have these beautiful and functional new surfaces. I love to cook…so having 2/3 more counter space makes me a very happy girl. He also replaced all of the old, deteriorating plumbing and put in new drains. I am constantly in awe of Matt and his craftsmanship. He did such a great job! There are a few more photos of the process in our “Renovations” photo set here. A unique composite material that utilizes a bio-based technology and exhibits the beauty and elegance of traditional burled woods. How Does Dakota Burl® Benefit Our Environment? Manufactured from a rapidly renewable agricultural fiber product. No out-gassing solvents are added during the manufacturing process, thus the material emits no VOCs into the atmosphere. What Does Dakota Burl® Look Like? The defined black outlining complements the natural yellow and brown tones of the fibers creating a distinctive pattern. Natural or stained, the material resembles authentic burled woods, giving a wide range of color options. The burled pattern and natural appearance run throughout the thickness of the material. How Does Dakota Burl® Work? The material cuts, sands and routes with standard woodworking tools. Traditional wood staining and finishing techniques can be used on the material to create a wide range of appearances. Four foot by eight foot panels are manufactured in 1/2″, 3/4″ and 1″ thicknesses. Superior panel properties allow for a variety of applications. Table Surfaces, Horizontal and Vertical Surfaces (transaction surfaces and interior decorative wall applications), Cabinetry, Furniture and Architectural Applications are all excellent uses for Dakota Burl®. Edited to add: We have had some trouble with water damage already on the countertop…and after researching a bit more, we found that it’s not recommended near water sources. So….we will be sanding and sealing it more and hoping for the best! After 10 straight days of painting, hammering, sawing, and praying…we have officially “moved in” to the RV. You can see the entire renovation process and the final photos HERE. We are really happy with how everything turned out…it truly feels like home. It should…because we were able to use all of the same colors and decor as we had in our previous apartment. It was great not buying anything…and yet having a totally new space. We re-used it all…curtains, photos, hardware, lamps, etc. 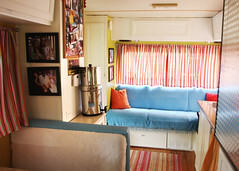 It’s quite an odd, yet wonderful thing to have a house on wheels. We have all the comforts and familiarities of our favorite things…but we can choose to change what we see outside of our windows in a moments notice! What fun! So there you have it. We’ve been living in the RV for 5 days and we’ve loved every moment of it. It does have it’s own unique challenges…but it brings unique joys as well. We’re looking forward to welcoming you into our new home! Overall, our RV is in GREAT condition for it’s age (1994). But, because this is going to be our HOME…we wanted to make it our own. Our goal is to make cosmetic changes to the interior of the RV using earth-friendly materials, so that when you tour our RV, you’ll be able to see different “green” options for your OWN home. There is a fabulous sustainable building center in Bozeman called Refuge. After talking to them about our tour, they generously donated all of the paint we needed (low-VOC, non-toxic), and also some beautiful bamboo flooring for the entire RV. A HUGE thanks to Dave, Dan, and Mary for taking time to help us with this project. They are a great asset to the community! I’ll be posting more info about the paint, flooring, etc. in a future blog…stay tuned! You can see ongoing photos of the renovations here. We’ve ripped out all of the existing flooring, repaired water damage in the floor, repaired the tub, modified cupboards, painted everything, and will be putting in new flooring and window coverings next. We hope to have most of it completed sometime next week. We’re excited to finally MOVE IN to the RV!